30" x 48" 30" x 30" 24" x 30" 30" x 72" 36" x 36" 24" x 24" 24" 30" x 60" 30" x 96" 36" 30"
Add a unique, rustic ambiance to your Irish pub, ski lodge cafe, or nature inspired hotel restaurant with this Lancaster Table & Seating 36" round recycled wood butcher block table top! Made from recycled wood, this table top is not only more environmentally friendly than models made from farmed wood, but also provides your establishment with a distinct aesthetic that can't be duplicated. The butcher block style top highlights the natural beauty of the array of different wood species. 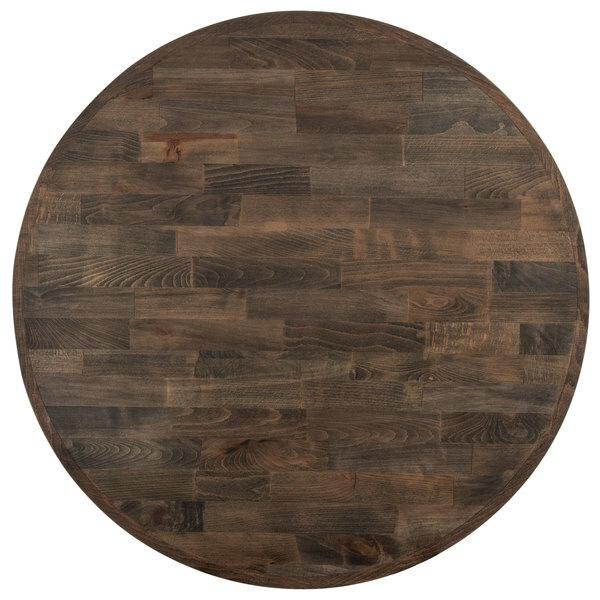 Beech, birch, pine, ash, and oak are all found in this table top and complement as well as contrast with one another through natural grain pattern variance as well as shade. With a dark and rich espresso stain, each strip of wood accepts the stain differently, giving a uniform appearance while simultaneously allowing each unique species to stand out.